Day 78. Outside Rawlins to the National Forest, just before Colorado. Wow. Today was tough, though now, lying comfortably and warmly in my sleeping bag, the day’s difficulty is slowly seeping away. 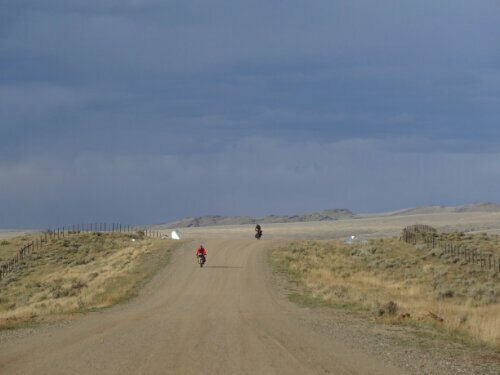 The wind slammed us as soon as we got on the bikes; Wyoming seemed not to want to let us out of its clutches. We rode 51km today, and it was an all day effort, averaging probably 7, maybe 8km/hr in the morning, and thankfully we were probably doing 10 or 11km/hr in the afternoon. Don’t even bother converting that to mph. Talking this morning at breakfast, we didn’t expect to go farther than 45km, but here we are. We had a good dinner tonight. Virgile and Marion are quite proficient fire-makers, so we had a nice one to huddle around and get warm. Almost everyone who drove by us and talked to us today said we’re crazy to be riding the Divide this late, and that it’s going to snow tonight for sure, we’d better get moving. One man was quite rude about it, insisting we’re the last riders of the season, when who knows, there could easily be someone behind us, especially if they came down from Alaska and started there a week or two after we did. People have ridden the Divide later than we are now, and if the snow gets too bad, then it’s just time to find a different route. Maybe everyone’s just excited because this will be the first snow of the season. Whatever happens, for now we’re safe in our tents, and once we reached the forest, the killer wind died down. Cold we can deal with, especially with climbs to warm us. But wind, headwind, is just mentally-draining, an invisible force against which we can do nothing but put our heads down and struggle against. It won’t be the last headwind we encounter, though. Headed to Patagonia, where it’ll be a toss-up whether we get lucky and catch tailwinds across the region or will be fighting headwinds the entire time. There the winds are legendary. This is just practice. Strong winds and gravel roads make a good argument for biking with nose and mouth covered. So windy that pushing is as fast as walking. Day 75. A&M Reservoir to before Rawlins. Windy night, had trouble sleeping because of the tent sides flapping around. But up early, sun hits the tent almost as soon as it rises in the desert, nothing around to block it. We make oatmeal and coffee, rationing and closely monitoring our fuel use to last all the way to Rawlins. Great Divide map listed Atlantic City as having ‘all services’ but apparently this doesn’t include gas stations, so Marion and Virgile are running low on fuel. I have just enough alcohol left that we scrape by. Today marks our third day in this desert, we camp just outside of Rawlins tonight and then will spend tomorrow in the city. The Divide maps say that this section of the route has the least water north of New Mexico; coming through in September, we found at least one place to resupply each day, more than we expected, so we’re carrying more water than we needed. But it’s been hot during the day, so maybe earlier in the summer we would have drunken a lot more water. First 20km of the day are almost straight into a headwind, but we form a paceline and push through it. 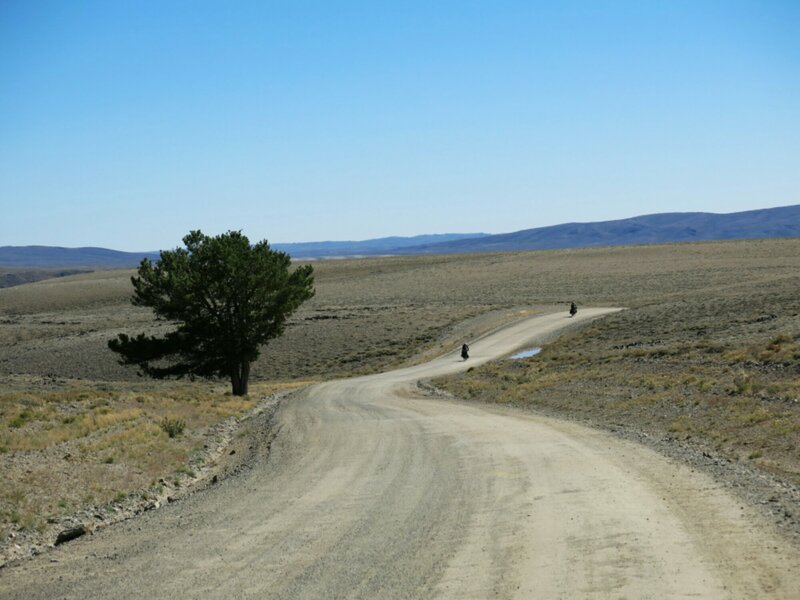 Then we turn left and after 5km the wind changes to a massive tailwind, propelling us forward for 30km to the junction where we stop for lunch. We can see storm clouds brewing, the first clouds seen after three days under the endless blue sky in the desert, so we eat lunch under the body of some construction vehicle. The storm breaks just as we finish lunch, so we spend the next 45min huddled under this machine staying warm until the storm passes. 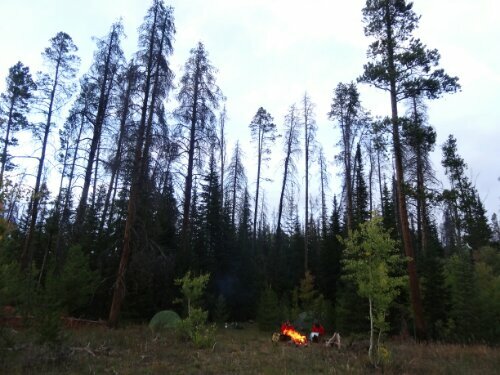 Then only 10km to our campsite for the night, we get the tents up and Virgile makes a big fire where we recover from the chill of the storm and cook and drink coffee and hot chocolate. 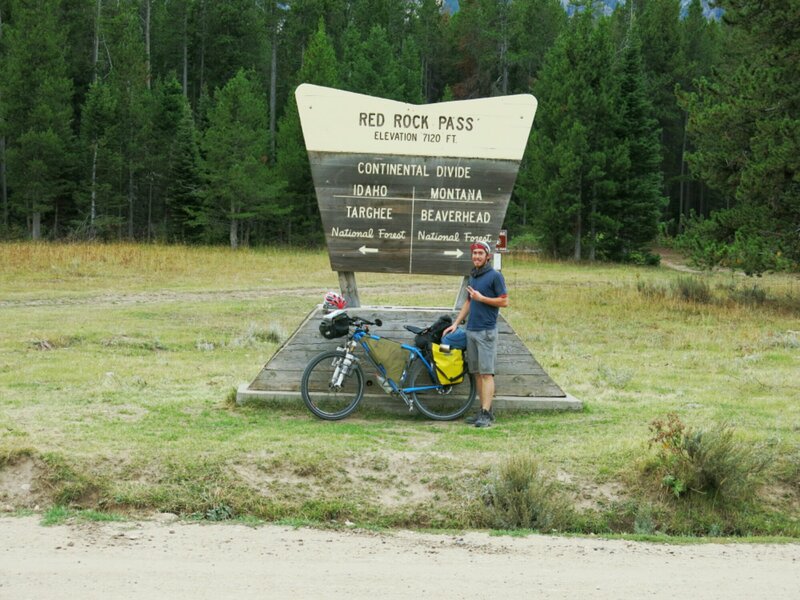 I’ve crossed the Continental Divide 9 times now on the route. The desert we just came out of is called the Continental Basin, where water drains neither to the Pacific or Atlantic but stays trapped in the ground where it falls. I had no idea this kind of landscape existed in the Rockies, thinking it was all just rocky ground and mountain forests. 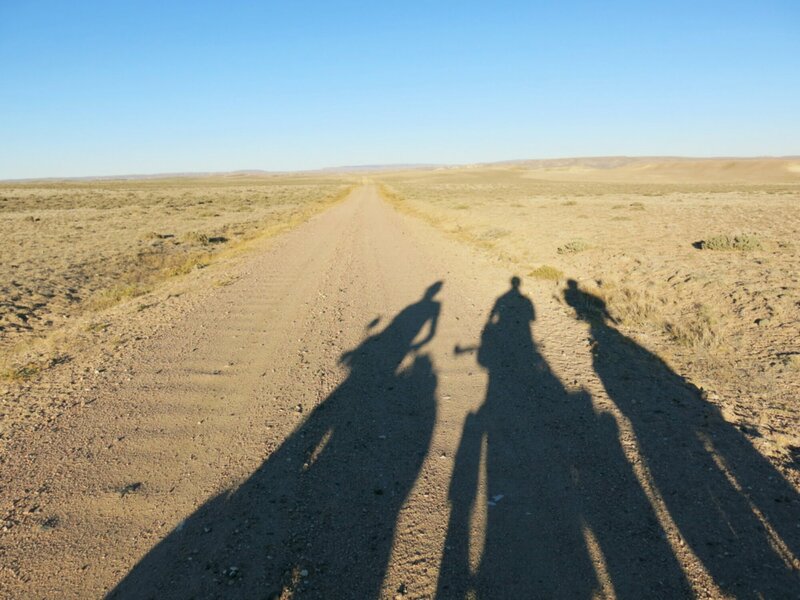 In three days of riding we spent nearly every single moment alone, the only other people we saw were the occasional hunters (hunting the antelope that roam this desert) and on the second day, some oil workers. The basin is said to have more oil than Saudi Arabia, all shale oil, and if it starts getting developed this section of the Divide will be very different in a few years for sure. Will be in Colorado in just a few days now, headed for the towns of Steamboat Springs then Silverthorne then Salida to Manitou Springs, is the current plan. Will either then continue riding the Divide into New Mexico or alternatively head into Oklahoma/Texas then west to Arizona. And so the ride continues. Last tree for three days. Chilly mornings are common now. Continental Divide crossing number 5. This little guy was digging big holes in the road. Weather climbing up to Union Pass. Left Jackson, with a face I don’t entirely recognize and without a razor that no longer works. Cycled north to a campground with hiker-biker only spots, no one else is there, though the drive-in camping spots are all full. Stop just outside the campground to chat and join the Logans for cocktail hour, who provide salmon and peanuts for appetizers and buffalo jerky for the road ahead, which comes in handy a few days later atop one of the passes. I eat dinner right before I crawl into the tent at night to read/write/whatever. Lately have been cooking or eating at least partially by headlamp, but now everyone’s pretty much back at school and there are no more immediate deadlines to meet so hopefully the days of cycling will get shorter with more rest time and earlier stops. 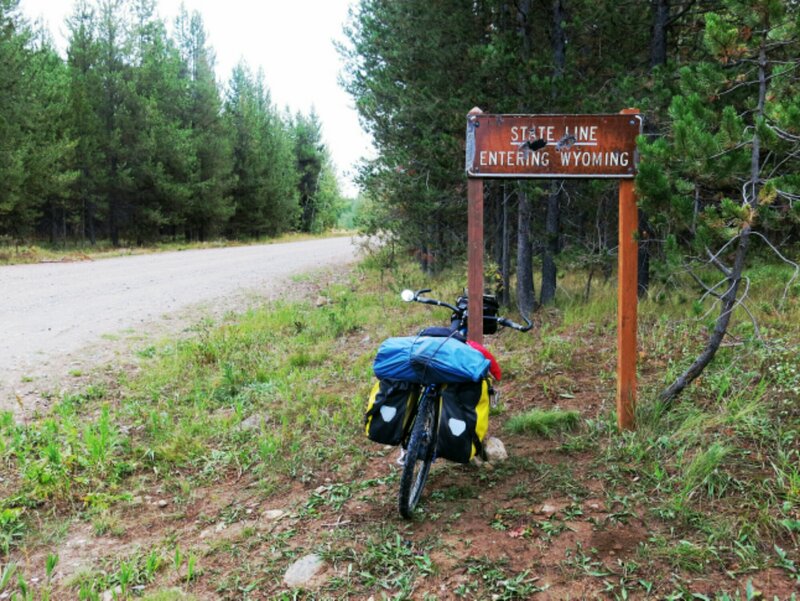 Back on the Divide the next day, this week getting mostly out of Wyoming involves climbing over nearly one pass per day, and hence at least one crossing of the Continental Divide. The fourth day out has two crossings. Climbs overall not bad, the narrative makes the climb up to Union Pass sound ominously difficult but it’s just long and gradual, not too steep at all. Maybe would be a different story if the road was wet and muddy. 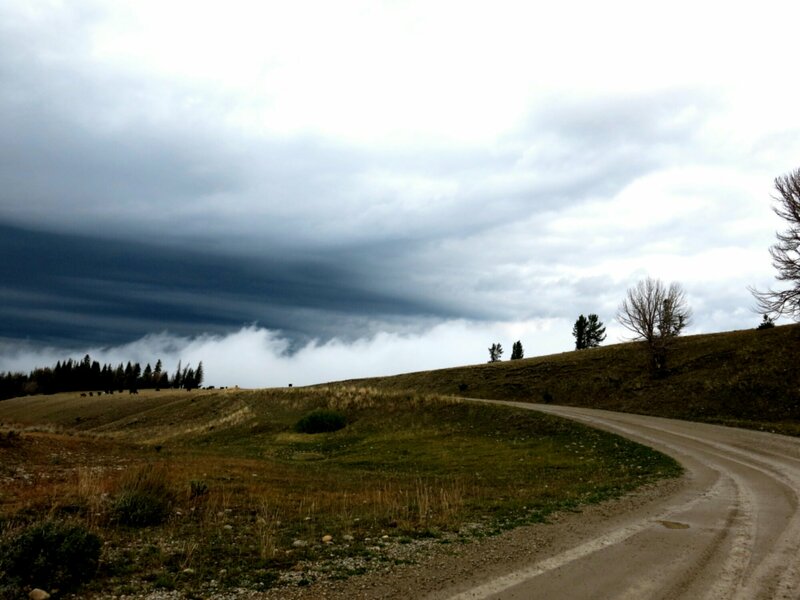 The area between Tegoetee Pass and Union Pass seems to be caught in a round of storms, the sky overhead constantly going from blue to black. The storms generally only last about 20 min or so, just have to bike with a constant eye on the sky and watch for stands of trees or building overhangs to take cover under when the storm lets loose. Depending on how long the climb to the passes takes, sometimes I end up camping right near the top after going through, if there’s no time or energy left to descend. 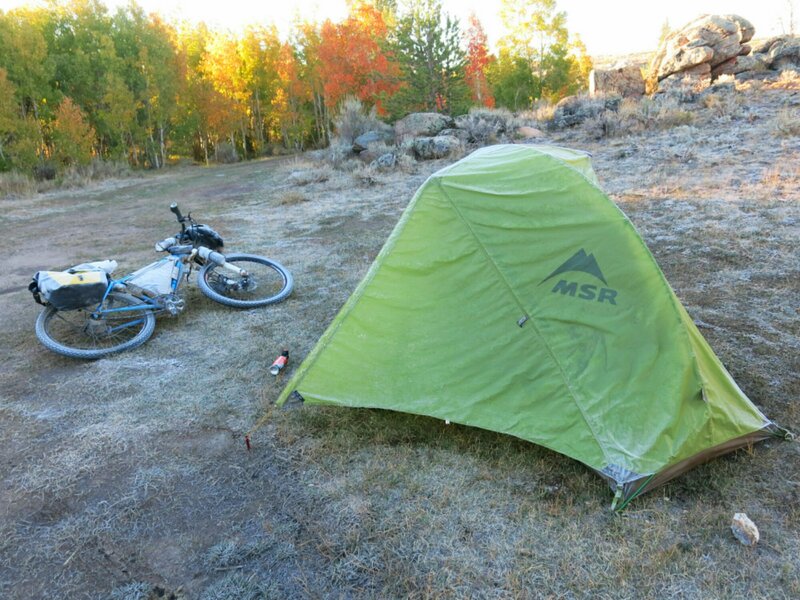 Hence my highest camping spot has now been at over 9500′, and it was cold in the morning until the sun came up. Camping on the southern side of Union Pass made for an interesting night; finished dinner and had just climbed into the tent when the circling storm clouds let loose. First just thunder and lightning right around the tent, then a bucketing of hail that turned all the ground white. Some patches were still left in the morning, though thankfully no ice in the water bottles so must have been just above freezing. I picked up some winter mittens in Jackson and they do indeed work. 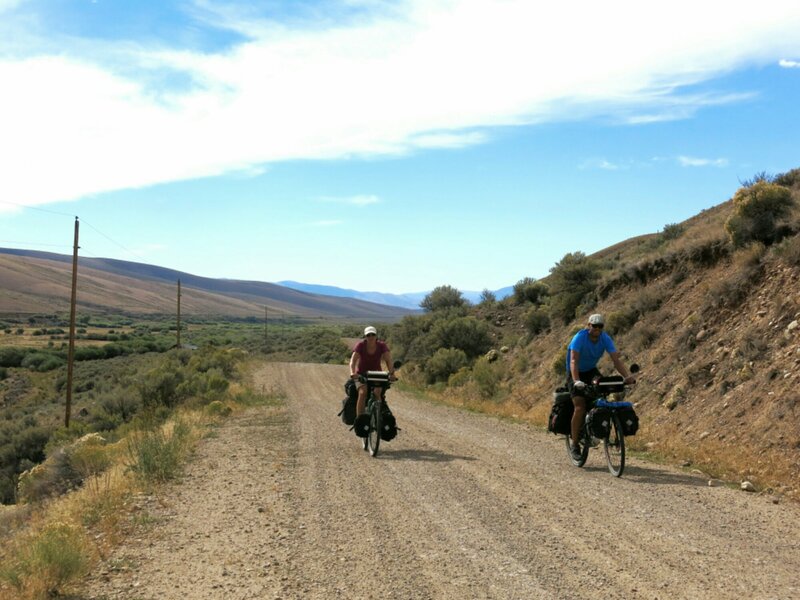 Am back to riding with Virgil and Marion again, caught up to them five days after Jackson, on the ride to South Pass City. South Pass City marks completion of the second portion of the Great Divide, and wow, what a ride. A tailwind pushed us through high, sage-filled grazing grounds, almost deserts, expansive with no end in sight except the mountain ranges on all borders. 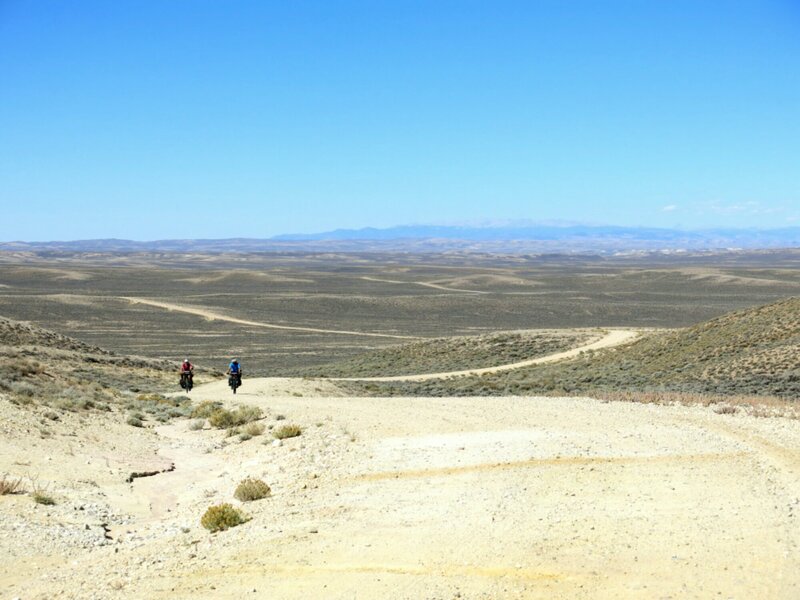 We dart through the ranges at South Pass, right where two of the ranges seem to intersect, and the desert starts immediately after. After South Pass City we have a two day ride with little water, so we’re loading up with 2-4 gallons each. Good to be riding with company again. Colorado looms next in the distance. Feels like a promised land of sorts, means successful completion of several portions of the Divide and some wonderful people to visit. Plus I flew out of there almost three months ago for Alaska, didn’t really expect to be back so soon. Have to do some route planning once I hit southern Colorado, options for immediately after include going south-east, south, or south-west. But good to have options. One week now on the Great Divide. I am blown away by this trail- never been on anything like it. 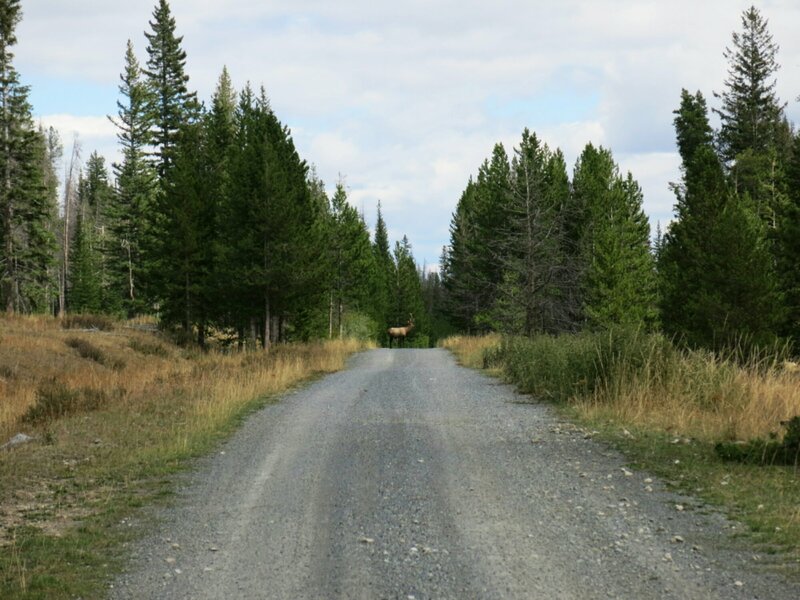 The roads that my map and instructions direct me down are gravel forest service roads through the National Forest, or old roads that used to be the supply routes between towns in the 1860s but are now “scenic byways” that no one else is on. 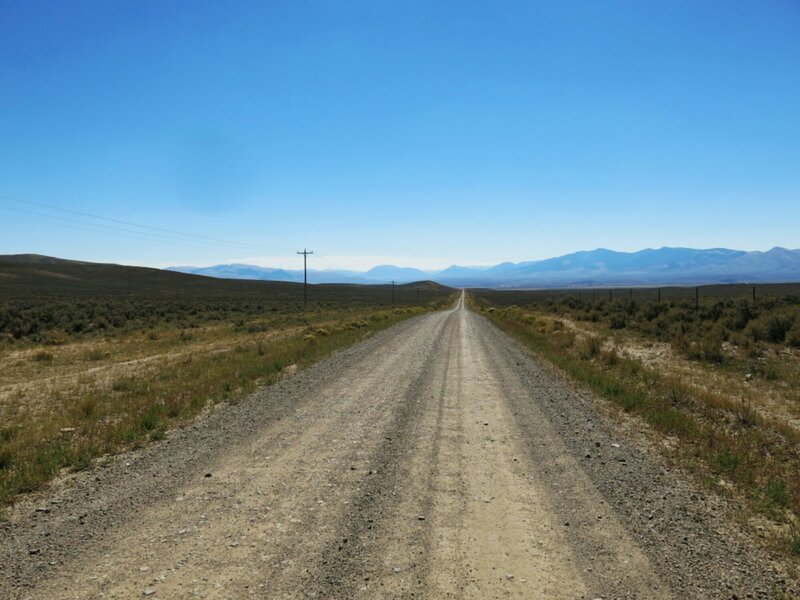 Through southwestern Montana the roads were beset on all sides by huge ranches, generally arid sage landscapes with cattle grazing all around. The cattle are not at all phased by bikes rattling down the roads until you’re within about 5 feet of them. 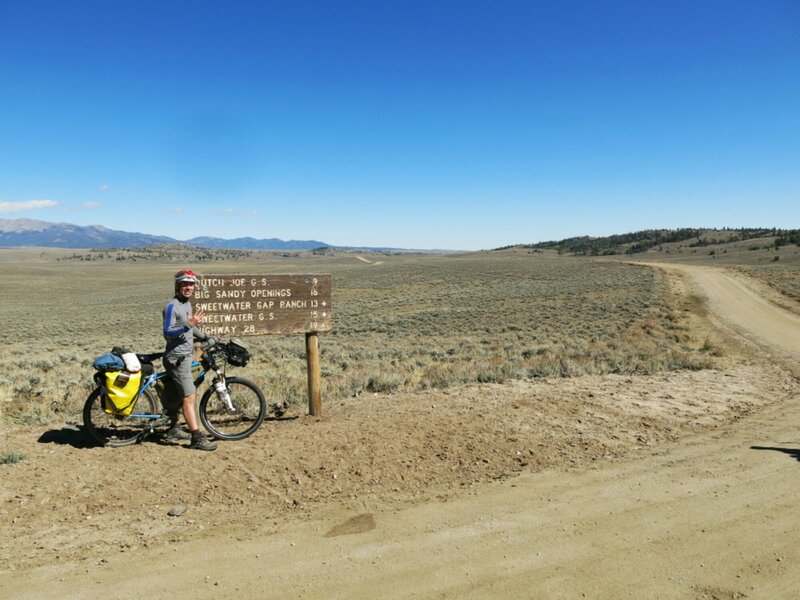 The ACA route directions and a working odometer are vital to staying on the trail, and even with both of those, it is still quite easy to get lost. 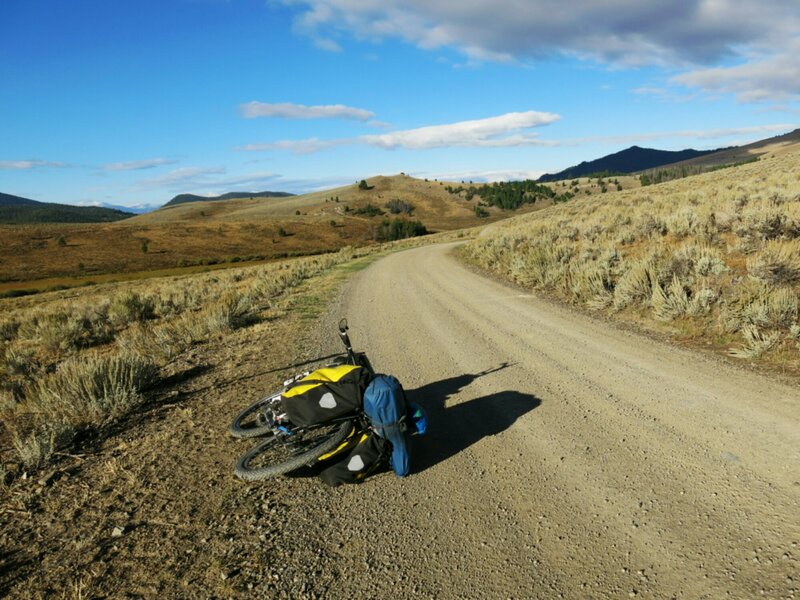 Seeing tire tracks from other bikers on the trail before you are good indicators of where to go at a fork in the road. 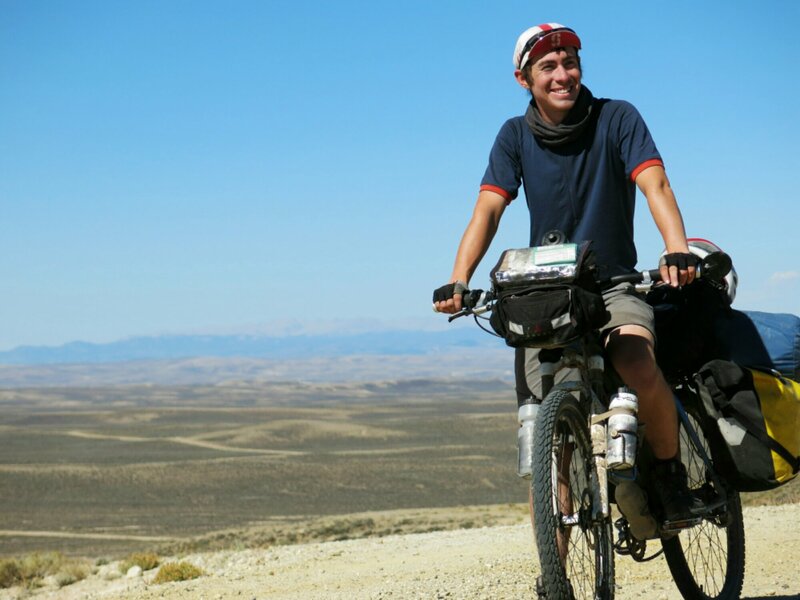 If you’re at all thinking of riding the Divide- do it. You won’t be sorry. Tired maybe, but not at all sorry. 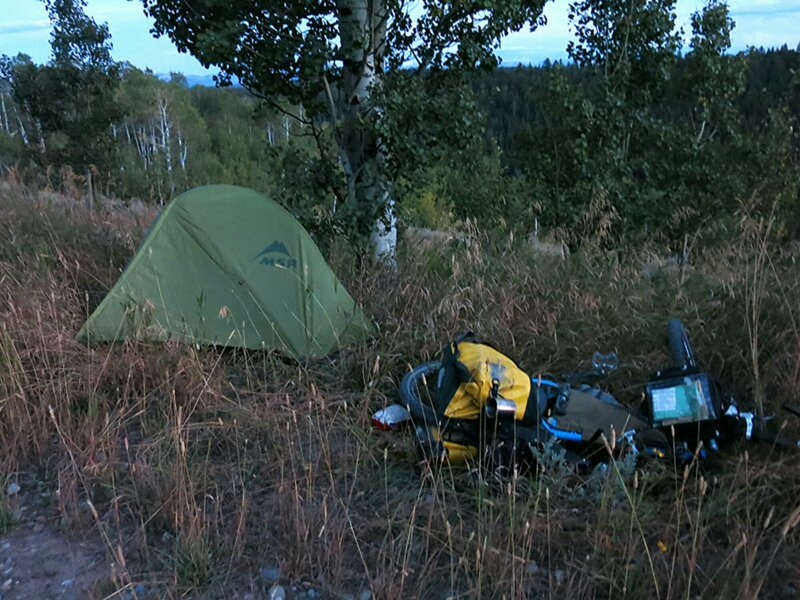 Immediately after joining the trail in Butte, I climbed to my first crossing of the Continental Divide and set up camp there for the night. It would have been a very quiet night, no one else around, except that hunting season has evidently started, and in some parts of the National Forest hunters are roving around in their 4x4s. Clear skies and a crisp morning. According to the route profile, the trail so far is always above 5,000ft, going to 6,000ft quite often, and hitting 7,000ft at the passes. Supposedly it will be even higher in Colorado. Woke up one morning with frost on the tent poles and ice in my water bottles. All the other nights seem to be hovering just above freezing. The forest roads are quiet. Cattle are the most frequently seen animals, though I came across deer and elk sometimes too. A lone tree on the climb up to Fleecer Ridge. The route instructions describe this climb as “legendary”, and for steepness and difficulty, that’s definitely a good description. The descent down the other side was even steeper though, and only rideable for about the first quarter or so. After that, the descent involved much burning through brake pads trying to gently guide Acero down the hillside. 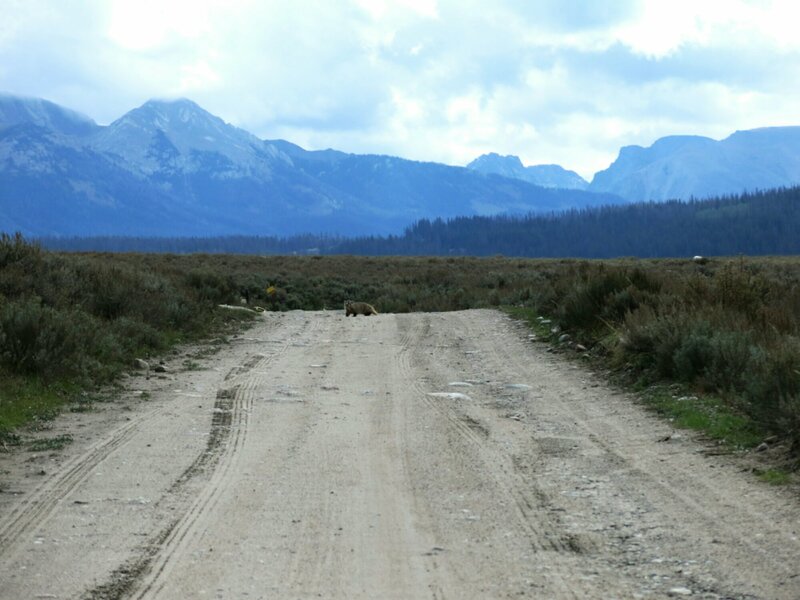 Montana vista. One nickname for Montana is Big Sky Country, and in this part it’s easy to see why. Sunglasses on all day, and breaks are generally taken whenever a lone stand of trees or rock outcrop puts out a little bit of shade. The roadsigns match the time period of the roads themselves. Continental Divide crossing #2 for me. 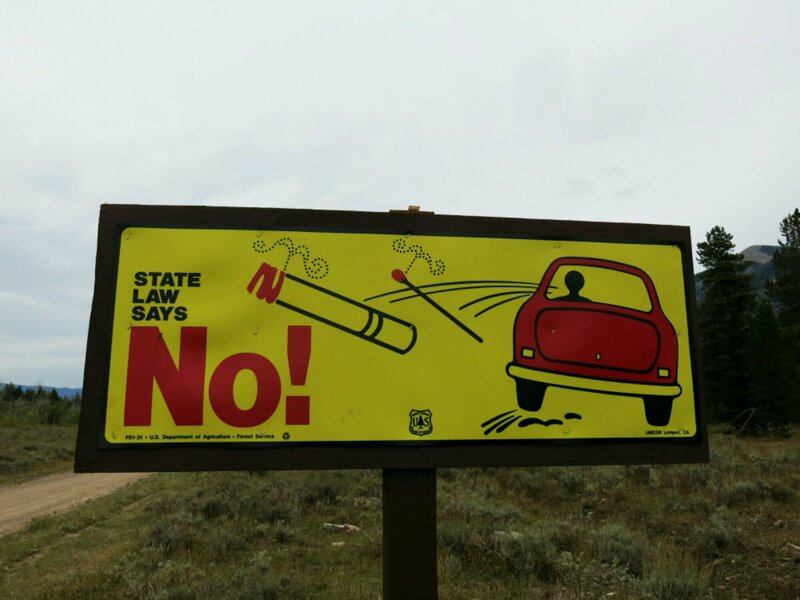 Into Idaho! 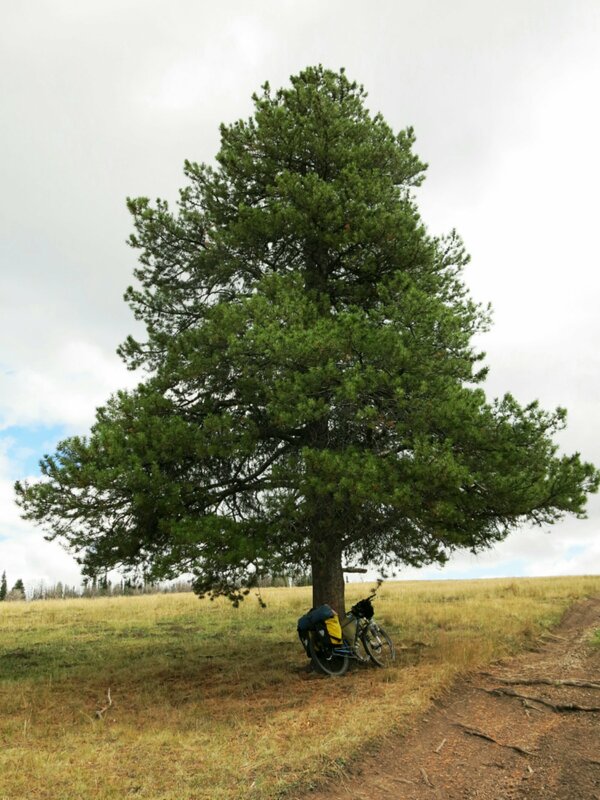 I caught up with Pignon Voyaguers a few days into the Divide. 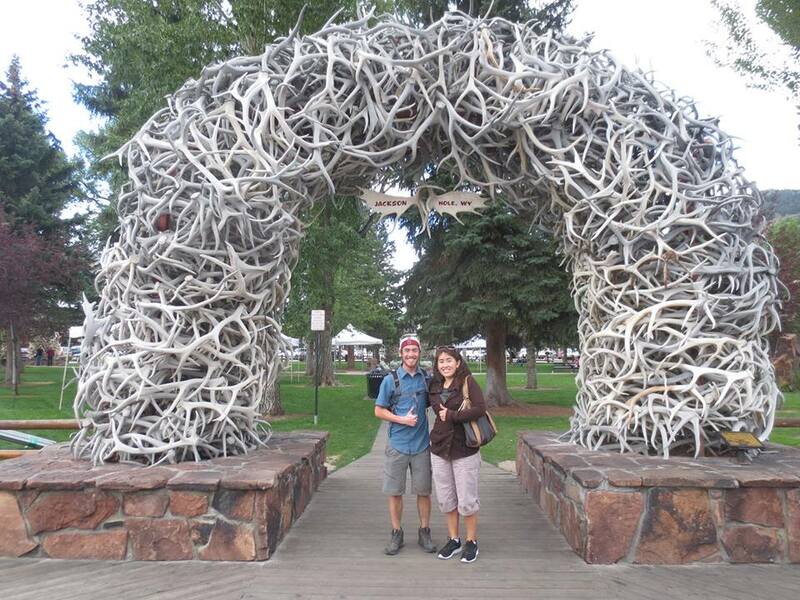 They, Marion and Virgil, are a French couple riding down to Argentina from Alaska. 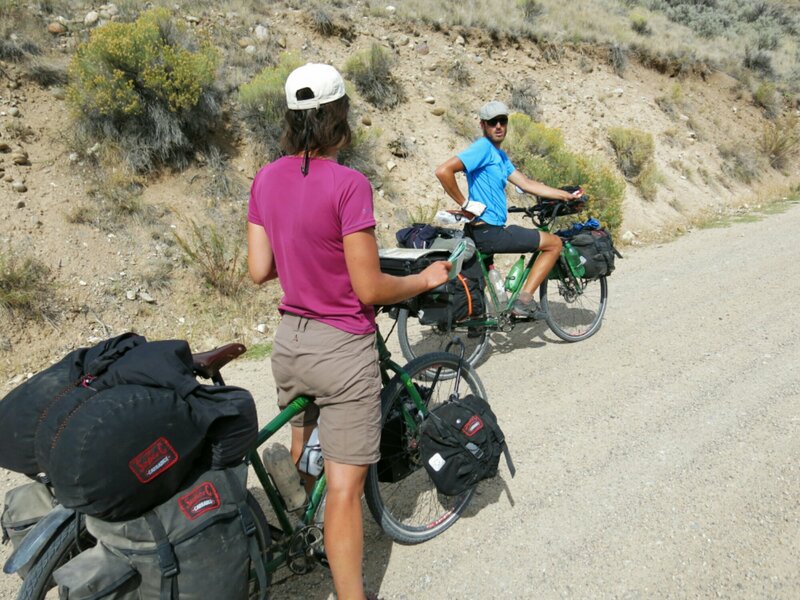 I had heard about them from Marc and Noemie, and wound up following their tire tracks for a few days before catching up to them on the road. 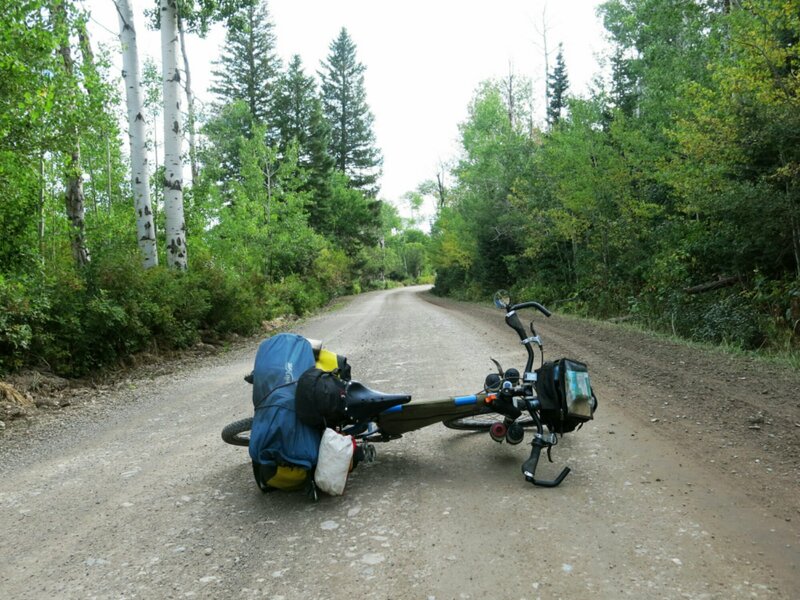 We rode together for a day, then I went ahead as I had a deadline to get to Jackson to meet a friend. 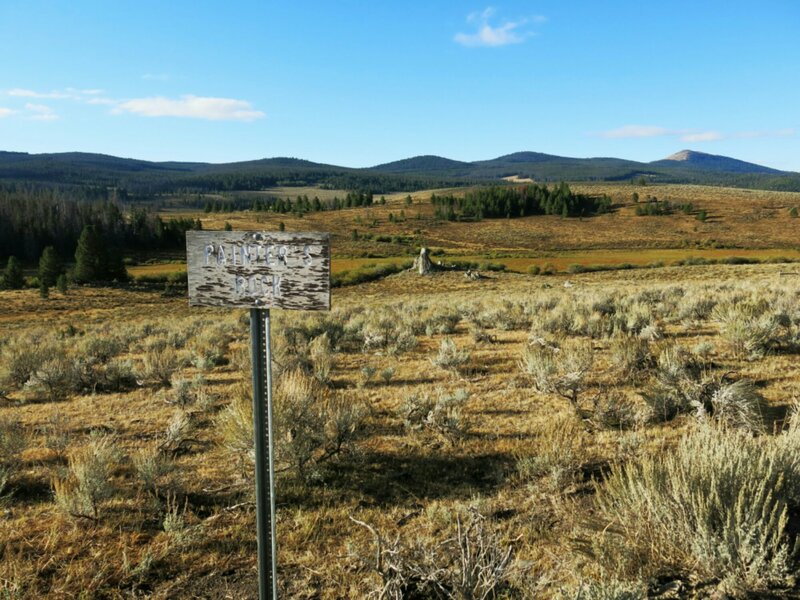 Outside of the National Forest, the landscape was always arid, sage-filled grazing lands. 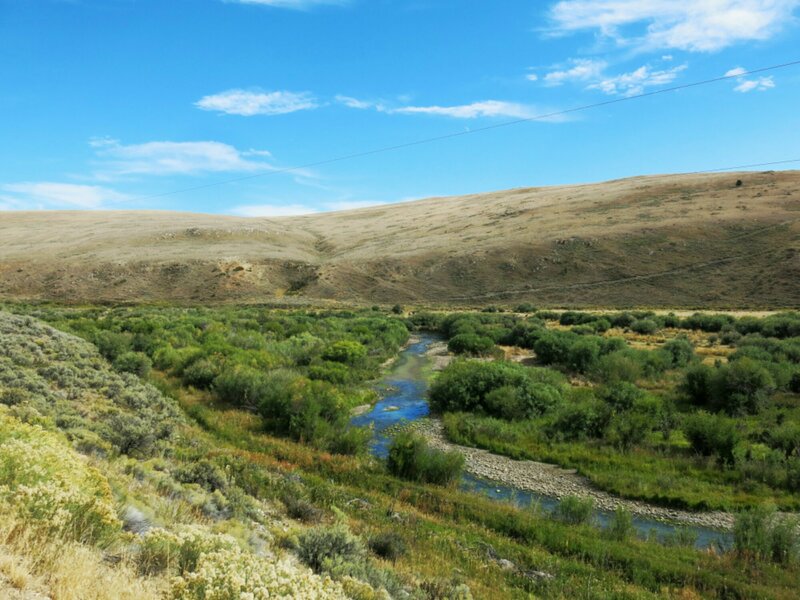 Creeks and rivers could be spotted from far off from the sudden green-ness surrounding them. After 3 days of seeing nearly nothing but sage deserts, trees promptly surrounded the road right before crossing into Idaho. 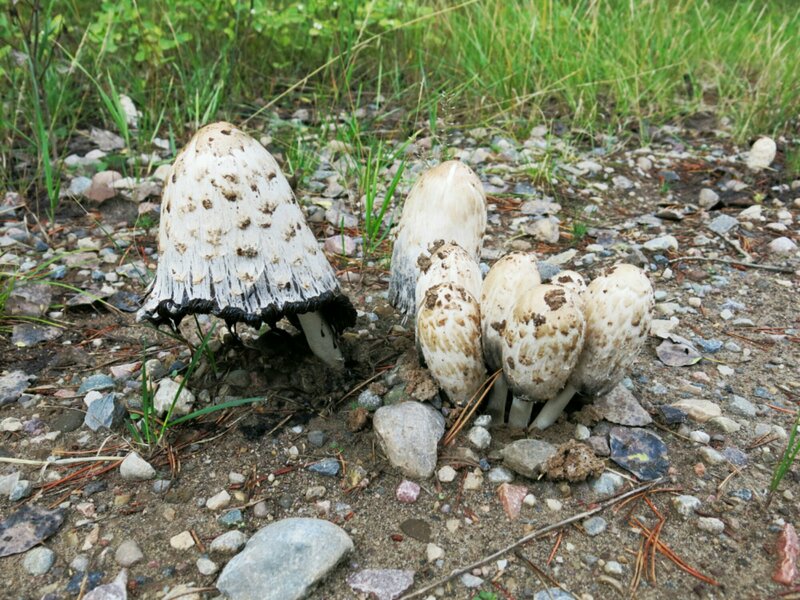 A spot beside the road to camp, just before Wyoming. Definitely more moist in Wyoming. Made it to Jackson to meet up with Santana before she headed back to school! 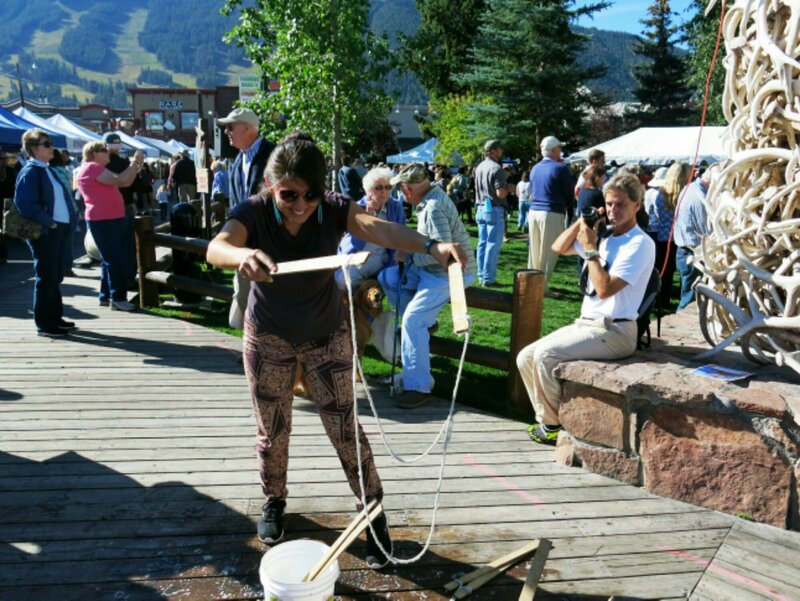 Jackson involved a fun day and night of wandering through art galleries and a farmer’s market with a bubble-making station. Headed deeper into Wyoming now, and Colorado is next on the agenda. And now back to the bike!